From the “no good deed goes unpunished” file, my zealous efforts of Friday produced a reward in the form of a strained muscle on the left side of my lower back. It doesn’t take much brilliance to figure out the wielding of a heavy pole saw with an engine on the low end and a spinning chain blade on the top turned out to be too much for my limited strength. It has forced a pause in my biking and plank exercises that has altered a plan to maximize my conditioning prior to the start of The Tour of Minnesota biking and camping trip in June. Maybe it was fortuitous, because the weather has taken a harsh turn to oppressively HOT! I am resting my painful muscle in the shade of the house. In a meager effort to be conscientious about the use of energy, I struggled to keep the house comfortable yesterday by managing open windows and closed shades. It was almost successful. This morning, I have already closed the house up and turned on the AC. If I am going to get anything done outside today, as I slowly try to regain function, being able to return to a comfortable house will be very valuable. I am home alone for a spell as Cyndie went to the lake place for a couple of days to contribute to the opening work-weekend. Jackie had a trip out-of-town planned before she moved in with us, so I am minding the ranch. Delilah has been a sweetheart, allowing me to rest without constantly begging for attention. I think maybe she notices how crazy hot it is outside and her fur coat doesn’t like being out in the blazing sunshine on days like this. Walking does seem to be good therapy for my sore muscle however, so we have made the rounds, staying in the shade of the woods as much as possible. 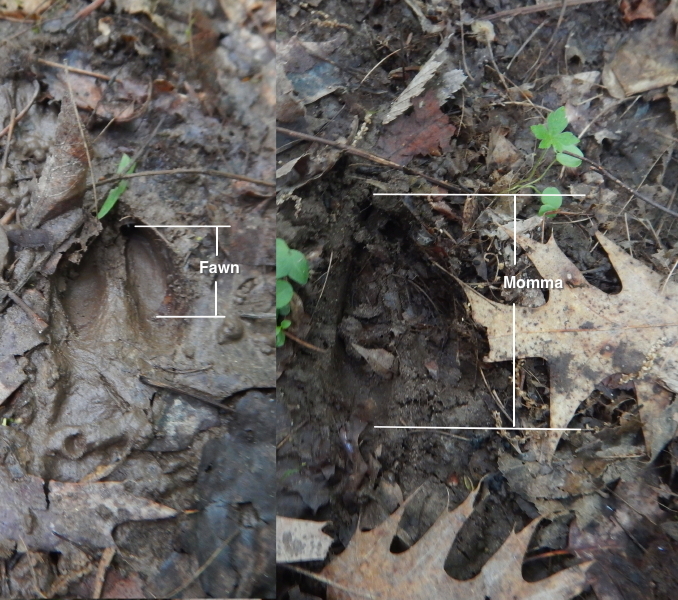 This morning, we were rewarded with deer hoof prints on our trail that revealed the presence of a brand new fawn, based on the teeny-weeny size. I tried to capture an accurate depiction of how tiny the little prints were, but even that doesn’t do justice to how surprisingly small they really look. After we looped around on another trail, Delilah almost pulled my arm off when she struggled to chase some deer cutting into the woods by the labyrinth. The only view I could get was of a tail. No babies in sight. Our next stop was the barn, to feed and clean up after horses. While we were in there, both Delilah and I noticed some shadows moving outside the front door. 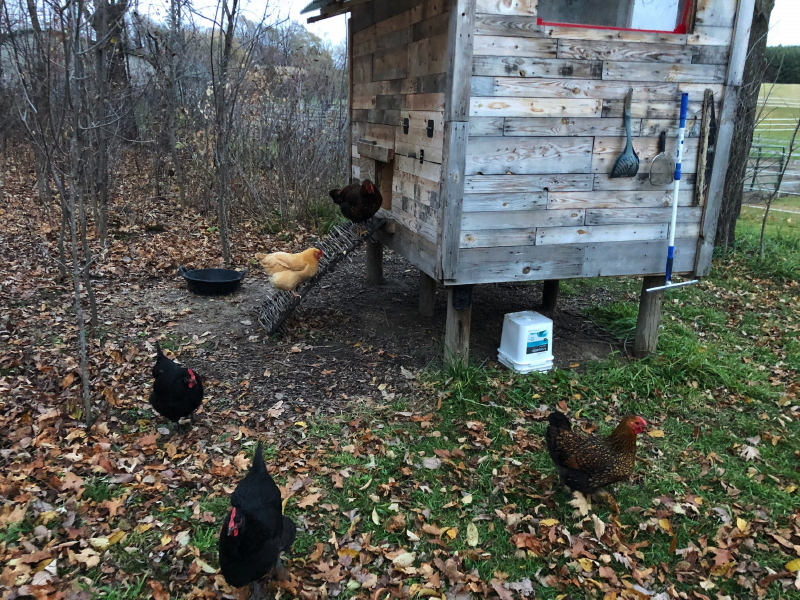 It was the chickens! They are expanding their territory nicely. I’m also anxiously counting their numbers every time I come upon them. Still twelve. Here’s hoping baby deer and baby chickens all find a way to achieve a healthy first year, and my strained muscle finds a way to heal fast enough that I can get back to biking, despite the heat.